1.7 Why a Baitcasting Reel? If you’re looking into the purchase of a baitcasting fishing reels, you’ve come to the right place. 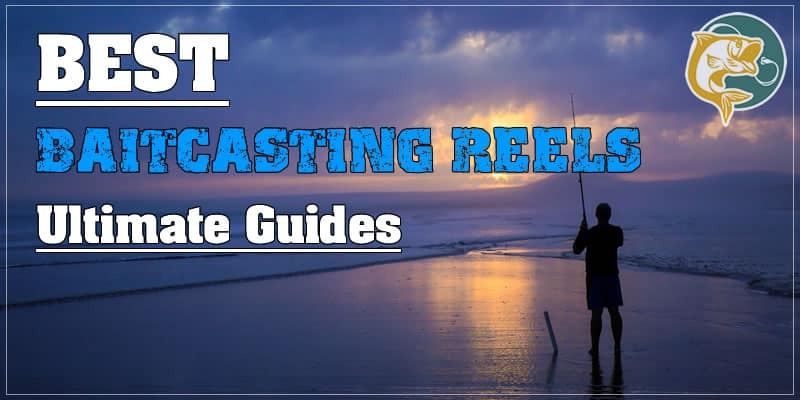 Whether you’re looking for the basic information you’ll need to make an informed purchase, or just want to find a high quality reel to meet your needs you’ll be able to find the best baitcastsing reel in the following text. Many advanced anglers find that they begin exclusively using baitcasting reels as time goes on, and even if you still prefer spinning reels there’s no shame in diversifying your tackle for different purposes. This reel from Abu Garcia is a great starting place, the C3-6500 is the biggest in it’s series and is perfectly suited for mid-sized fish. You’ll be happy with the pragmatic overall design of this reel, and while it doesn’t feature an amazing amount of add-ons the important stuff is there and solid. It features the ultra-smooth Carbon Matrix drag system, which will keep your line from peeling out in a jerky fashion once you’ve engaged your target. The drag maxes out at fifteen pounds and makes this a great reel for catfishing, and is easy to set with a centrally mounted star drag. The ability to rapidly reset the drag without having to take your hand entirely off the handle means you can change your tactics on the fly and deftly land your quarry. The 5.3:1 gear ratio will make prolonged fights a lot easier, the lower gearing allowing you to really get a hefty pull on the fish trying to get away from the line without overburdening you. With four high quality bearings as well, you’ll be glad you made the purchase once you see how smooth and easy the line retrieve is. The reel is high quality, and is sure to keep working well for a long time to come with proper maintenance. A lot of fishermen start with an Abu Garcia of some sort, and quite a few still have their first beloved reel, this brand is made to last. The centrifugal braking system may not be the best for beginners, but if you spend the time properly learning how to cast with this reel you’ll rapidly find yourself making accurate casts without worrying about backlash. If you’re looking for a great catfish reel at a decent price, this may be just the thing you’re looking for. This is another great reel from Abu Garcia, suitable for an entirely different sort of fishing. With its higher gear ratio and drag, you may just have stumbled into an amazing reel for your bass fishing purposes. Featuring a black and red, mean looking aesthetic, this reel looks great in addition to offering the kind of functionality you’ll need. With ten high quality bearings and a 20lb drag you’ll rapidly find that this piece of equipment is just the thing you’ll need for fighting with aggressive bass. The magnetic braking system is another big plus here, making this reel ideal for those who aren’t sure how to contend with a centrifugal braking system just yet. It will allow you to easily make an accurate cast with a constant slow-down through the whole motion by slowing the reel. Once you have it set properly for your tackle, the consistent pressure will allow for easy and laser accurate casts. 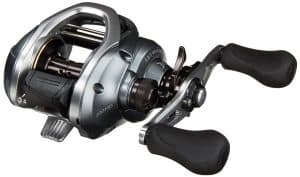 This reel features a lot of Abu Garcia’s proprietary technology, from the drag system to the brake to the corrosion resistant alloy frame, each and every piece of this reel is well thought out and made to suit its purpose perfectly. Even the line guide is coated with titanium, making for smoother action on your casts by reducing friction. The spool is specifically designed for heavy loads and heavy line, meaning you’ll be able to for the big ones with ease and the proper tackle. If you’re looking to get into bass fishing with a baitcasting reel, this is an excellent choice to consider. It’s hi-tech, looks great, and is perfectly suited for the purpose. 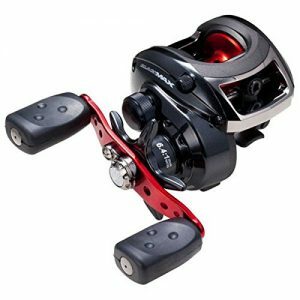 Yet another Low Profile reel from Abu Garcia, this reel is in a lower price racket than the REVO but it’s suitable for the same purposes. If you’re looking to get into fishing with a cheap, durable, and reliable reel you’ll find that the Abu Garcia Black Max Low Profile is exactly what you’re looking for. This reel is known to be a beginner’s real, perhaps the beginner’s reel in the world of bass fishing. Don’t let the reputation and the low cost fool you however, plenty of seasoned anglers still dust theirs off once in a while and make great catches with this iconic reel. This reel is pretty no-frills, it has just the right amount of tech to get the job done smoothly and cleanly which will keep you from overcomplicating matters. 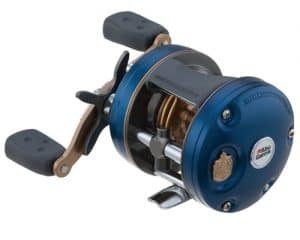 The magnetic brake system and smooth action will make this reel a veritable delight to hold in your hands, and you’ll be more than pleased with the price point. Like all of the Low Profile reels offered by Abu Garcia, the smoothness doesn’t end with the reel action. It’s ergonomic handles and easy to access star drag system will make it veritably jump into your hands, and once you’re familiar with it you’ll be fishing like a pro. If you’re left handed, you’ll also be pleased to know that you can score one of these configured for your dominant hand as well. For those fresh to the baitcasting world, there’s simply no reason to get started with this quality reel. If you’re a beginner and planning on sticking around for a while, there’s absolutely no reason not to cut your teeth on this great reel and get started on the adventure of a life time. Shimano specializes in high-tech reels, and if you’re into all of the latest technology they are the brand you absolutely want to go with. This particular model of reel is left handed, although the 200I is a right handed model, making this a reel suitable for any angler. Shimano makes high quality reels and pretty much leads the way when it comes to innovative technologies. This particular model features a proprietary braking system that the manufacturer calls the SVS Infinity. Apart from the impressive sounding name, what it means is that this brake is able to be tuned in extremely small increments using a small knob on the reel body. Shimano’s equipment can be a bit pricey, but it’s best to look at purchasing these high end reels as something of an investment. There’s a number of anglers out there who swear that they won’t bother without the Shimano name, and with their innovative technology it’s pretty easy to understand this slightly extreme position. It also features an exceptionally smooth drag system which is sure to please any angler once the fight is on. This is a great reel for freshwater fighting, and you’ll be quickly impressed with both the silky smooth drag and the amazing quality of its five bearings. If you’re looking to go for a high-tech, highly durable reel, you could do a lot worse than grabbing yourself a Shimano 201I Curado. The CI4+ designated model of Shimano reels have one enormous advantage over their competitors. This patented technology is amazingly light and features durability that is orders of magnitude over plain graphite or aluminum parts, and for a baitcaster that makes for an immensely strong reel. Make no mistake, this is a high end reel and you’ll definitely pay for it, but with all of the advanced technology and amazing engineering stuffed into you’re sure to be impressed with your purchase. This reel also features the amazingly adjustable SVS Infinity brake system, and you’ll find it’s absolutely perfect for freshwater applications and even light saltwater fishing. The gear ratio is fairly high here, so it’s not the best for pulling enormous catfish but if your prey is active and light you’ve found what you’re looking for. There can’t be enough great things said about this baitcasting reel, the only real drawback is the high price tag. It features eight bearings, and they’re all extremely high quality so the smoothness is sure to impress even the jaded angler. 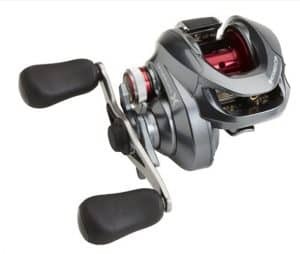 With its light weight and well-designed ergonomic grip you’ll find that you can use this reel all day with little to no fatigue, and you’re sure to want to. If you absolutely want the best baitcasting reel you can get for your freshwater fishing, you need look no further than this impressive piece of technology. Your wallet may not thank you, but when you invest in a great quality reel you can be sure it’ll last for years to come. Baitcasting reels, or just casting reels depending on your preference have a couple of specific advantages which you’re sure to want to be able to exploit if you’ve decided to add one to your gear. You’ll quickly see why these are the preferred reels to use for both bass fishing and large marine fish. Baitcasting reels are by far the stronger of the two major classes of reel. They allow for heavier lines and lures to be used, and you’ll be quite pleased to know that as a general rule they are quite durable and powerful. They’re perfect for prolonged fights with bigger fish, which makes them a great reel for a number of purposes. You’ll find that a lot of fishermen greatly prefer them for functions as diverse as going for catfish and trolling the open ocean. The primary advantage you’ll hear their users talk about with baitcasting reels though is accuracy of cast. This is especially important for freshwater fishing, where you might need to just barely avoid bushes or reeds in order to take advantage of the environment. The only disadvantage to using a baitcasting reel is that they’re a bit more difficult to master than a spinning reel and a bad cast can end up landing you with a bird’s nest of tangled line that may leave you a bit flustered. These reels require a bit of practice, but if you make the investment of your time you’re sure to find out why so many people swear by them. Now that you have a good idea of the advantages and slight disadvantage of this type of reel, you’ll need to know what to look for in order to make an ideal purchase. Whatever your needs are, you’re sure to be able to find a casting reel which will suit your style and target but there’s a number of factors to keep in mind for the aspiring angler. You’ll want to make sure that the reel you purchase has the right gear ratio for your needs. You’ll want something higher geared for smaller fish in order to make a quick retrieval, but a lower gear is ideal for when you’re hunting monsters. The typical measurements you’ll see are quite easy to read, it’s simply how many times the small gear turns compared to the large one attached to your handle. For instance a 6:1 ratio means the smaller gear will turn six total times for one crank of the handle. Even reels within the same series can have greatly differing spool sizes, and you’ll want to buy one that suits your individual needs. Bigger spools will allow you to utilize more and heavier line, but come at the cost of additional weight. On a reel designed for heavy use, you’ll need to make absolutely sure that the body is constructed of a great, solid material. You’ll lessen your chances of breaking this way, and the whole thing will last much longer. Remember though that heavier doesn’t necessarily mean stronger, there’s a lot of innovative, high-tech materials out there that are also extremely light. This is a great case where the specifications of a reel can be a bit deceptive. A lot of low quality reels might boast a whole lot of bearings, but if they aren’t of high quality you might be better off with half the amount of extremely well made ones. These are especially vital to allow for smooth casting, increasing your accuracy and decreasing your chances of a messy backlash. The braking system of your reel is a vital consideration when you’re considering your purchase as these devices are integral to your cast. You’ll find that there are a number of systems available, but the main two are magnetic and centrifugal. For the beginner a magnetic brake may be the one to go with, as most manufacturer’s magnetic brakes will function evenly throughout the cast while a centrifugal brake generally only functions during the latter half. This will be the main setting you’ll need to tweak on your reel when you change tackle, so pick whichever one you’re more comfortable with. This often overlooked aspect of your set-up is vital for a reel meant for the long, hard fights you might encounter. Pick a reel that’s guaranteed to be comfortable in your hands and you’ll have a much more pleasant fishing experience, some modern reels have put a lot of time into creating a great handle for your reel but everyone’s hands are different. This feature is prominent on pretty much all modern reels, but it’s vital to making a quick and sure hook set. If a reel doesn’t have this feature, you don’t want it. 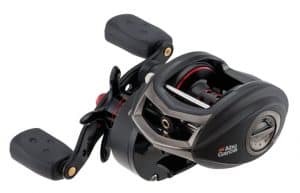 If you’re still on the fence about purchasing a baitcasting reel, give the Abu Garcia Black Max Low Profile a shot, it’s bargain price and high quality will convince you there’s something here. For those who already know the thrill, the Shimano Chronarch is simply one of the best fishing reels in the market place for its purpose. Once you get the hang of your baitcasting reel, you’ll understand why so many anglers swear by them. Making an informed purchase of one might just be the next great step on your fishing journey.